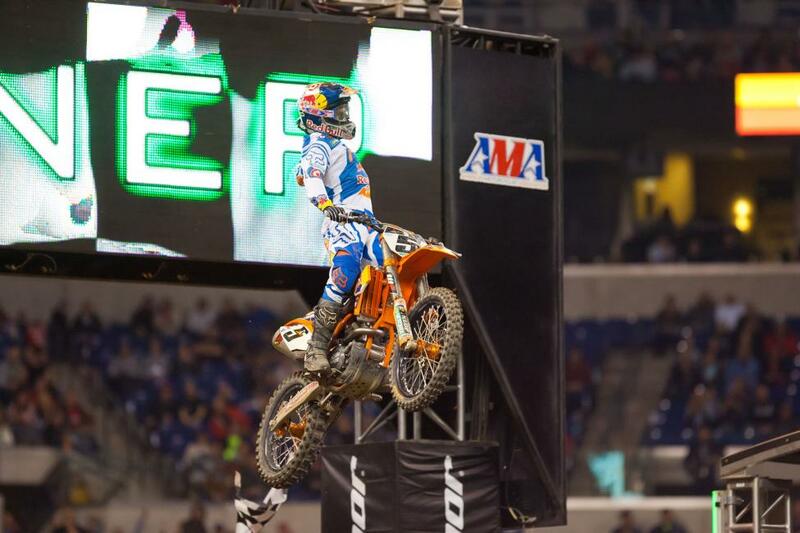 Round 9 of Monster Energy Supercross from Lucas Oil Stadium in Indianapolis, IN, produced not only one of the toughest tracks of the year, but also the fifth different winner in 450SX in Red Bull KTM's Ryan Dungey. 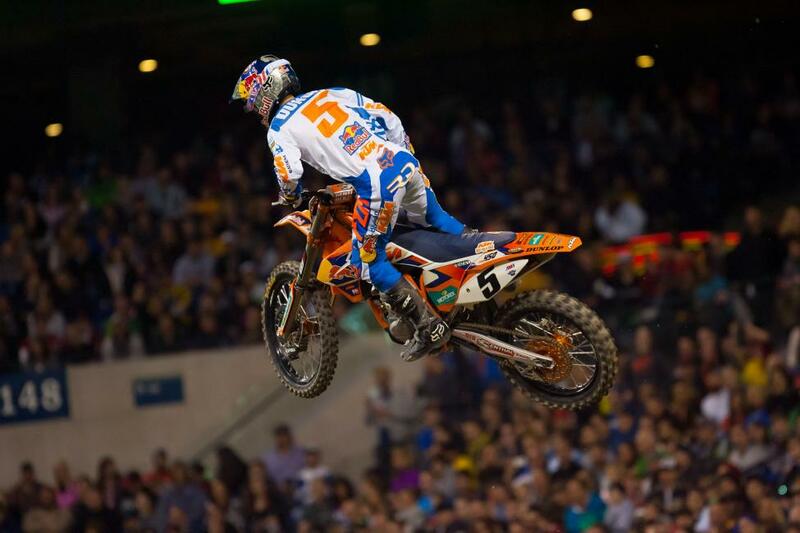 Dungey's first win of the season moved him into second in points, 23 behind Monster Energy Kawasaki’s Ryan Villopoto. 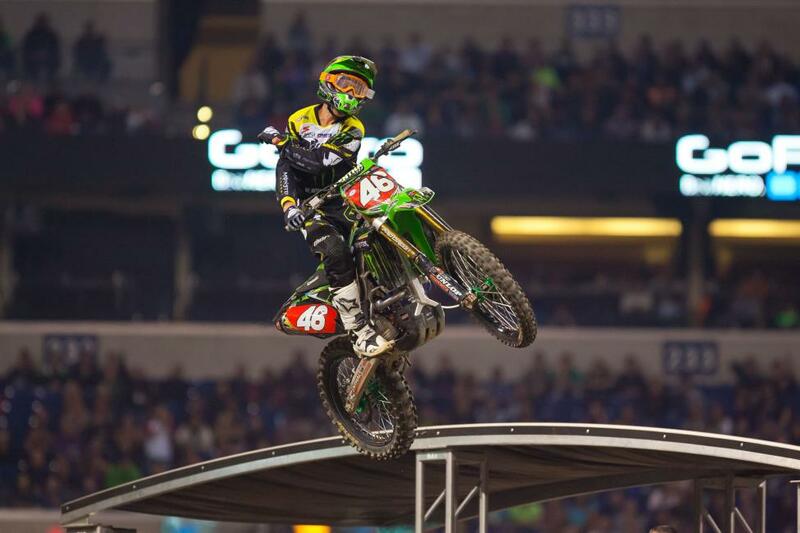 In 250SX, Monster Energy/Pro Circuit Kawasaki’s Adam Cianciarulo took advantage of teammate Martin Davalos’ mistake, and overcame a mistake of his own, to become the first two-time winner in the class. Davalos would rebound to finish second, with GEICO Honda’s Justin Bogle rounding out the podium. A tight first corner produced carnage in the main event, as points leader Ryan Villopoto along with Ken Roczen, James Stewart, Dean Wilson and others were left picking up the pieces after a first turn pileup. Following a week filled with controversy, MotoConcepts Mike Alessi pushed everything aside to grab the holeshot over Ryan Dungey and Eli Tomac. Alessi was stubborn early, hold off the advances of Dungey. 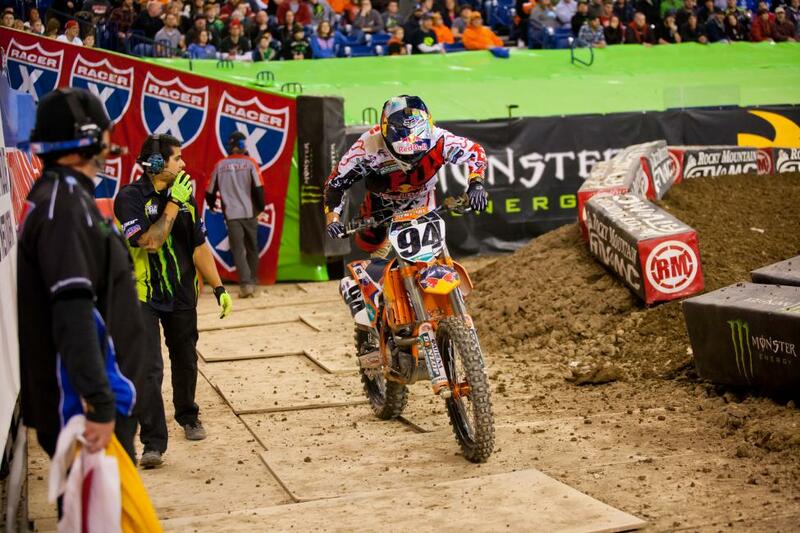 But Dungey was relentless, drag racing past Alessi and into the lead following the steep wall jump. With Dungey out front, the championship aspirations of Ken Roczen took a giant hit. Following the first turn crash, Roczen had worked his way eleventh before another huge crash left him on the ground. 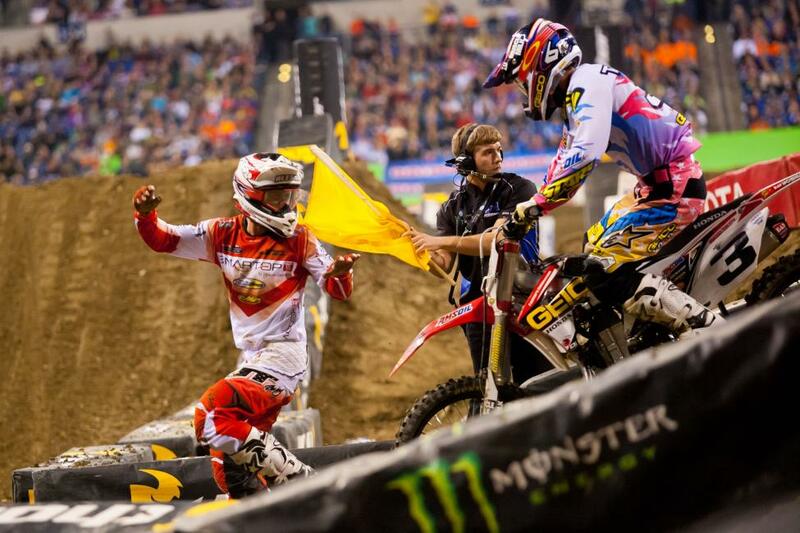 Roczen tried to return, but was unable to finish. He finished the night 21st. Points leader Ryan Villopoto was taking a different approach, picking off riders left and right, eventually working his way up to fourth, salvaging a ton of points on a tough night. 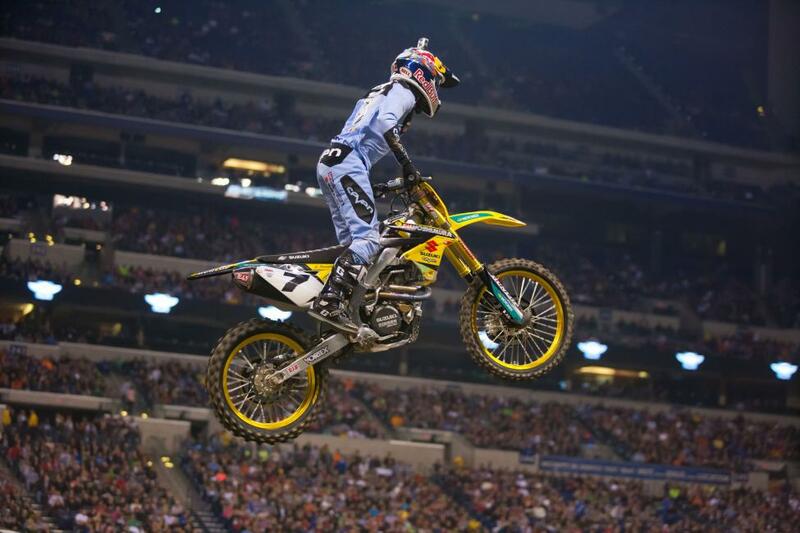 James Stewart was never in contention after the first turn, finishing the night seventh. 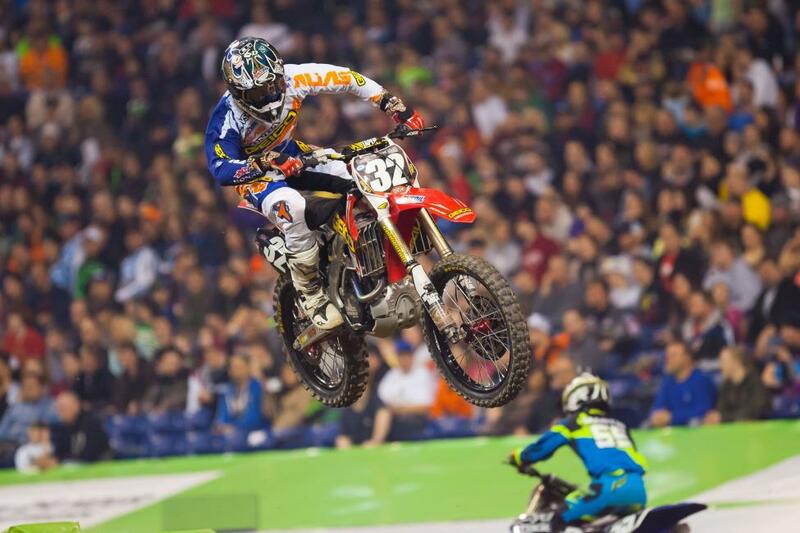 With Ryan Dungey walking away with his first win, Eli Tomac and Mike Alessi were left to battle for second. And for a while, it looked like Alessi was going to hold on for his first podium since 2009 until he cross rutted on the tough rhythm section before the triple and left second for Tomac. 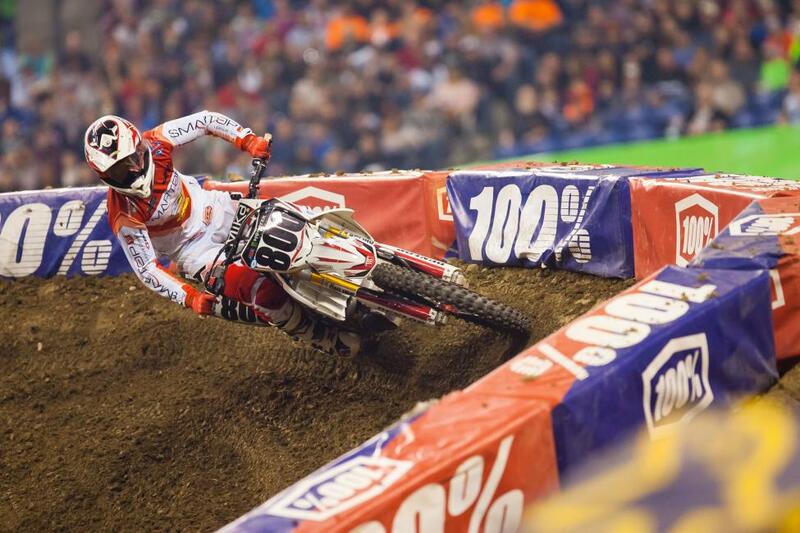 Cole Seely, in his fill-in ride for Honda Muscle Milk, was strong all night. 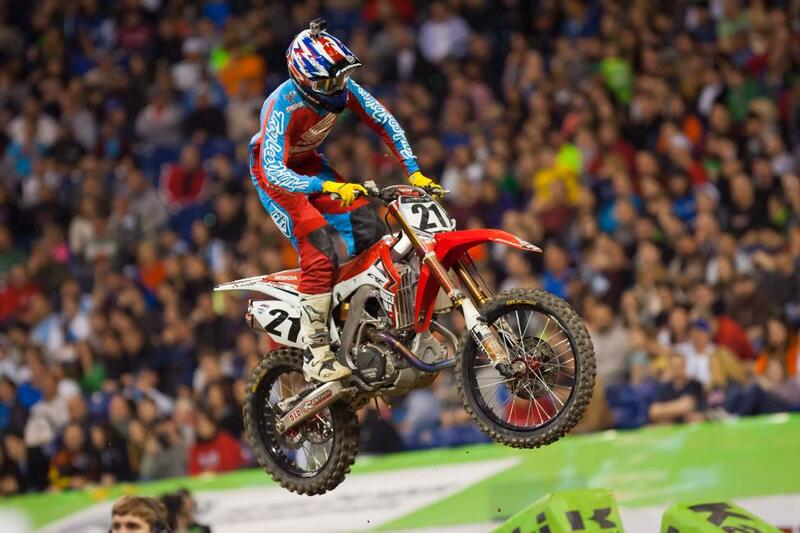 Seely would round out the podium—a career first. Ryan Dungey celebrates his first win of the season. Factory Metal Works/Club MX’s Vince Friese would lead the 250SX class around the first corner, grabbing the holeshot over Monster Energy/Pro Circuit teammates Adam Cianciarulo and Martin Davalos. Davalos would quickly shoot into the lead, with Cianciarulo tow. Davalos opened up a quick gap, but a costly mistake in a deep rut—than went down to the plywood—left Martin scrambling to regain the lead. 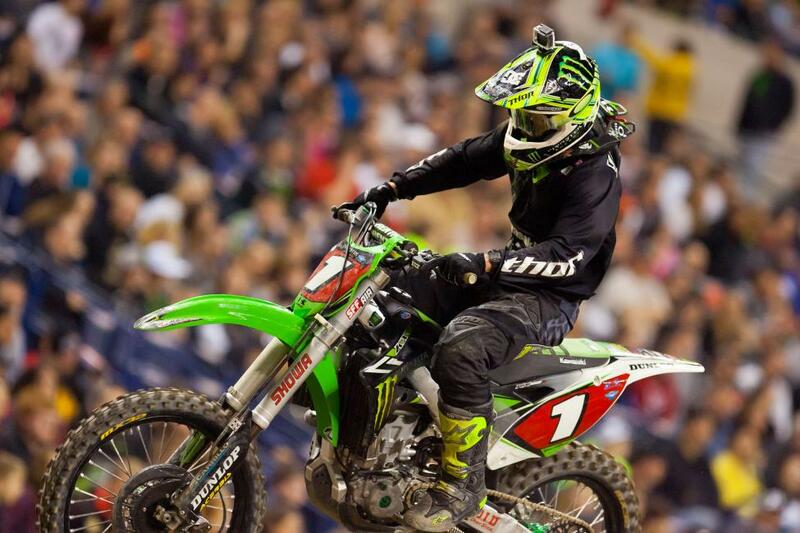 Cianciarulo took full advantage, until a costly mistake of his own let GEICO rookie Matt Bisceglia to close in. But Cianciarulo was able to use the quad to his advantage—the only 250 rider we saw hitting it—to open back up the lead, leading to his second win of the season. Bisceglia would eventually fall back to finish fourth—a career high for the rookie. GEICO Honda’s Justin Bogle overcame another lackluster start to charge back and capture his second straight podium. The first corner swallowed up a handful of riders at the start of the 450SX main event, including top riders such as Ryan Villopoto, Ken Roczen, James Stewart, Dean Wilson and a few more. Alessi was able to pull through with the holeshot, and Ryan Dungey and Eli Tomac were right there behind him. Justin Brayton and Cole Seely followed them up in fourth and fifth. Dungey pulled into the lead and past Alessi by drag racing him into the corner following the steep wall jump. Tomac challenged Alessi but eventually fell off the pace, but Alessi gave up second after a nasty crash. 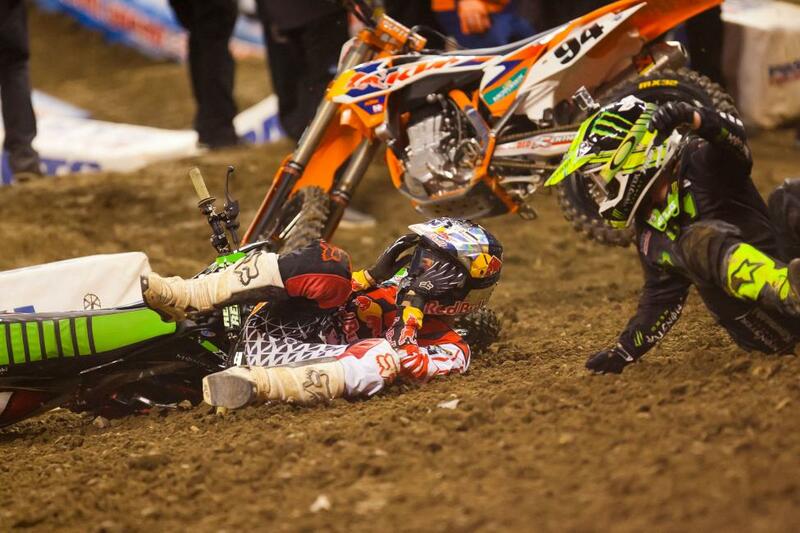 Villopoto and Roczen had moved into the top ten, but Roczen crashed out after experiencing a nasty crash as well. Villopoto was able to move up to fourth, but wasn’t able to catch Seely for the podium position. Tickle followed up Villopoto in fifth for an excellent ride. Tomac held onto second place—his first 450SX podium ever—and Dungey rode a very consistent race and on to his first 450SX win of the season. 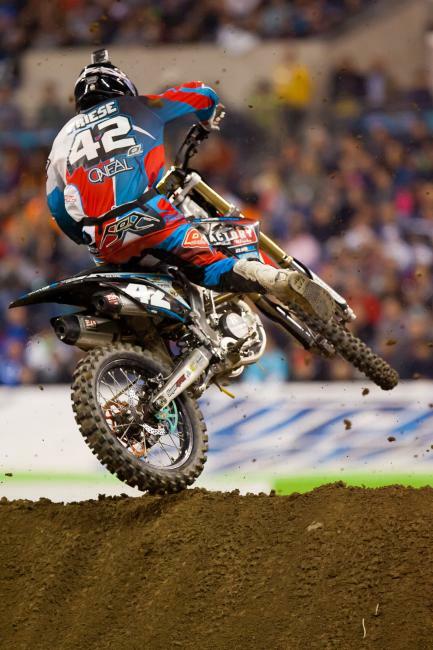 Vince Friese was able to get the holeshot over Martin Davalos by a knobby in the 250SX main event. 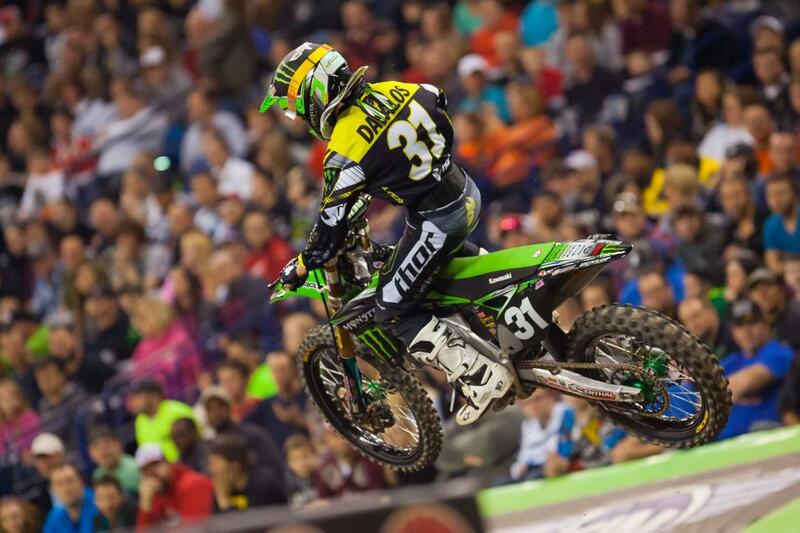 Adam Cianciarulo was right there in third, and both he and Davalos were able to get by Friese through the second turn. Jimmy Decotis and Matt Bisceglia rounded out the top five early in the race. Bisceglia was able to move past Decotis and Friese into third after the opening lap. Friese fell back to fifth, allowing Decotis to hold down fourth for quite some time. Meanwhile, Davalos dropped his bike and gave up the lead to Cianciarulo—and second to Bisceglia—after losing the back wheel on the exposed plywood flooring. Cianciarulo low-sided exactly one lap later in a low-speed corner, but was able to pick his bike quick enough to keep the lead. Justin Bogle made his way up to fourth halfway through the race after a poor start. Both Davalos and Bogle were able to move past Bisceglia to finish in podium positions, while Cianciarulo went on to win his second race of the season.